A range of facial tissues and also hand towels that are Z-Fold, C-Fold, Interfold in 1 and 2 Ply's in Various colour options. Compatible with most hand towel dispensers. A box of 2688 C-fold hand towels compatible with a wide range of dispe..
An economical 1-Ply Z folded hand towel. 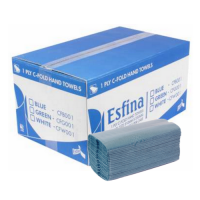 Designed to fit a wide range ..
A box of economical blue interfold hand towels. Each towel is interlea..
A high quality 2-Ply White C-fold embossed hand towel manufactured fro..
A box of quality 2 ply white embossed z folded hand towels compatible ..
An economical blue embossed 1-Ply Z folded hand towel. Designed to fit..
A white 2-ply hand towel supplied on a roll for use in roll towel disp..